You don’t get named CHIME-HIMSS CIO of the Year Award by being afraid to take a few risks — for Jim Turnbull, thinking out of the box has been like second nature for more than three decades. From his first Meditech install in the 70s, when going electronic “felt like an experiment,” to Utah’s initiative to increase transparency by posting physician reviews online, Turnbull has always believed in pushing the envelope. In this interview, he talks about what it takes to foster innovation, his plans to move to an integrated system, how the organization works to retain top talent, and the work they are doing in a host of areas, from telemedicine to patient portals to population health. He also discusses his career background and why he supports a unique patient identifier. We are able to hire into almost every single position. We’ve got one or two consultants working on a project. I know that’s a little unusual from talking to my peers across the country, but in this market, for some reason or other, we’ve had no problem filling the positions. It’s an exciting time to work in IT and healthcare. There’s no lack of challenges, and I think that’s one of the things that tend to keep people here as well. They’re busy. They’re challenged. The attempts previously have been a little bit more top-down and we just realized this is crazy. We don’t know what these people want. So they came up with some really interesting ideas. We just recently initiated a more formal telemedicine program under the direction of one of our doctors here. He’s working harder at establishing relationships with physicians in other communities using, rather than the heavyweight teleconferencing capabilities, more of the one-to-one, desktop-based telemedicine capabilities. We’re just trying to wrap our heads around how do we manage that and how do we deliver it as a service in terms of supporting the docs here. It’s another program that’s very new and very much in its infancy and we’re just trying to figure out how do you do that the best way, particularly as we try to keep patients in their homes post-discharge. Gamble: Hi Jim, thank you so much for taking the time to speak with us today. Turnbull: No problem. Thanks for the call. Gamble: To start off, why don’t you tell us a little bit about your organization — what you have in the way of hospitals, clinics, things like that? Turnbull: We have about four hospitals. They’re all here on the University of Utah campus. There’s the Jon Huntsman Cancer Institute, and we have a neuropsychiatric institute with about 140 beds. It’s run in the Research Park area of the University of Utah. We have an orthopedic hospital. We only have a few beds in there but there’s the occasional surgery that we do over there where we keep the patient overnight. And then there’s the main hospital, which is maybe 520 beds or so. This is an academic medical center, which is totally staffed by our faculty. Basically if you’re not a faculty member, you can’t get privileges here. We do around 30,000 admissions a year, and some are in the neighborhood of a little over a million outpatient visits per year; a lot of those occur off campus. We have about 12 offsite ambulatory facilities now, and we’re continuing to add on to that list up and down the Salt Lake Valley. Gamble: In those clinics, are those physicians that are employed by the system? Turnbull: Yes, but they are primary care physicians in those areas, although we do have specialists that rotate through some of them on a fairly regular basis. Gamble: And it’s a pretty extensive area, geographically, that you provide care for? Turnbull: Yeah, this is the only academic medical center from Denver to the coast, basically. We serve about seven states so it’s a pretty big drawing area, but as you can imagine, other than the Salt Lake Valley it’s a fairly lightly populated region. We have a lot of telemedicine programs that reach out remotely because of that as well. 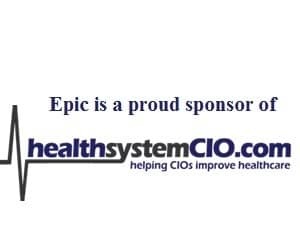 Gamble: As far as the application environment in the hospitals, are you using Epic? Turnbull: No, at the current time, we’re a combination. On the inpatient side, we have a Cerner environment with a plethora of other applications, but primarily GE. GE has several applications in the OR and the radiology suite. The ambulatory and the revenue cycle applications are all Epic at this point in time. We have this thing that we developed about a year and a half ago called the bridge that actually links our Cerner and our Epic EMRs together. It’s contact-sensitive so when you’re in a record for a particular patient, if you click on the button for the other application, if you’re going from Epic to Cerner, when you get over there you’re actually still in that patient’s record. You don’t have to sign back in. That was an application we developed here in-house. Gamble: Interesting. Is that something that you see a lot of in your organization — doing that type of development? That’s something that I would think might be an advantage being at an academic medical center. Turnbull: We don’t do a lot of development. We do a bit. A number of years ago, they actually tried to develop their own EMR here that goes back probably 15 years. And we still have a number of those people on staff, so they’re excellent programmers and they know the history and they know where the hooks are between the different systems. Some of that background enabled them to develop the bridge. We actually got one of the Most Wired Innovator awards last year as a result of that development. Just to give you a perspective, we get 30,000 hits a month back and forth on that system, so it’s well used. Gamble: As far as your plans for down the road, do you see continuing along with using the different systems, different vendors within the organization? Turnbull: Our plan is to move to an integrated solution and we’re currently working on that right now. We’ll put Epic in on the inpatient side; that project is currently underway. We’re hoping for a go-live some time in April or May of 2014. Gamble: Just from the size and scope of your organization, this is obviously a huge job. Are you using consultants or any type of outside help? Turnbull: It’s interesting. We have been very fortunate in being able to attract full-time staff here. We’ve brought in some staff in our legacy environment so they have moved over and have been trained on the Epic side and they’re in the midst of doing the implementation right now. We are able to hire into almost every single position. We’ve got one or two consultants working on a project. I know that’s a little unusual from talking to my peers across the country, but in this market, for some reason or other, we’ve had no problem filling the positions. Many of them have actually come from the consulting world — people who have had two or three implementations at different sites around the United States and they’re just a little burned out from being on the road all the time. Quite often they are people that have worked in this area and they’re people that enjoy the outdoors and have gone skiing in Park City and places like that. So when the openings come up, we don’t have too much of a problem filling them. Gamble: That’s a nice thing to hear because it definitely isn’t something that we hear a lot these days. As far as where you’re located, are you right near one of the bigger cities? Turnbull: The hospital, the University of Utah, is right in Salt Lake. Gamble: That’s one thing that you have in your favor. I don’t imagine it’s that hard of a draw to get people to move to that area. Like you said, the weather is nice, and you can enjoy the outdoors. Turnbull: Yeah, I think it’s really an ideal spot for anybody that enjoys the outdoors. The climate here is pretty mild on a year-round basis, and you have access to the Park City area and to all the national parks, particularly in Southern Utah, that are just spectacular. If you get the people with the right interest, this is a great place to live. Gamble: And you’ve been able to retain staff members fairly well? Turnbull: Our turnover is very low. Last year in IT our turnover was about 5 percent; the rest of our organization is probably closer to 12-14 percent, so we do pretty well in IT in terms of retaining our people. We have a recognition and retention program in our IT department that is actually run by the staff. They’re the ones who develop the concepts. We’ve had that going for maybe a little over two years now, and it’s really had a terrific impact on our turnover. A couple of years ago, this group came up with 85 ideas on how to retain people and we said, pick 10. Let’s do the first 10. Once those are grounded, then let’s take another 10. So we’re gradually working through it, but it’s clearly had a very immediate impact on our turnover. I think the other part is that it’s an exciting time to work in IT and healthcare. There’s no lack of challenges, and I think that’s one of the things that tend to keep people here as well. They’re busy. They’re challenged and we’ve got some exciting projects on the books. Gamble: I think that what you guys decided to do with the recognition and retention programs and having the staff themselves come up with some of the ideas — that makes a lot of sense to me, because they know what their peers want and what will really help them to stay engaged and stay with the organization. Turnbull: You’re right. The attempts previously have been a little bit more top-down and we just realized this is crazy. We don’t know what these people want. So they came up with some really interesting ideas. We do things like a community service day out in the community. We get a very strong interest in that from the group. We probably have close to 30 percent of our staff go out and do a day of service and work together, so that’s been fun. And we do a dress code thing that is different from the hospital. You can come in in jeans or practically whatever you want to wear, but you have to have an emergency kit at your cubicle or in your car so that you can change quickly and go to a meeting up at the hospital if you’re called up there at the last minute. That’s been in place for probably 18 months and we’ve never had a single issue with it. Gamble: Things like that can go a long way — just letting people be comfortable. And I love the idea of the emergency kit. That’s a great idea. Turnbull: It’s worked out really well. Gamble: You mentioned telemedicine before. Can you talk a little bit about some of the work you’re doing in that area? Turnbull: Yeah, this is a program that actually started as a state-wide initiative, and it was before my time. I’ve only been here five years, but it’s been in place for over a decade. The original funding came partly from the state and partly from different organizations across the state — some health centers, for instance, have kicked in money, and one of the Native Indian health services groups has been involved in it. Just to give you an example of the reach, way down in Southern Utah there is an area that is very difficult to reach by car; they actually have a house trailer out on the property and that’s the health center down there. We have a teleconference or a telemedicine link to it that’s actually a microwave link. They’ve got about a 150‑foot tower down there, and we beam a microwave at them from quite a distance, actually. It’s the only way to reach out to them. Most of the other areas are all connected through high-definition teleconferencing capabilities now, and we do some face-to-face telemedicine where you’re dealing with an individual patient and a doctor in a one-to-one connection, and there are many other cases. We do lots of grand rounds here with our faculty doing presentations so it’s also used for a lot of sort of tele-education to many of the facilities around the country. What we call the Utah Telehealth Network is really a state-funded program. The University Hospital contributes about 20 percent to it, and we use that for some of our own requirements as well. And then we just recently initiated a more formal telemedicine program under the direction of one of our doctors here. He’s working harder at establishing relationships with physicians in other communities around the state using, rather than the heavyweight teleconferencing capabilities, more of the one-to-one, desktop-based telemedicine capabilities. But that project is really in its early stages. It’s not like we’re attracting hundreds of doctors to that. It’s really a one-to-one development right now. Gamble: Right. That’s a unique thing about telemedicine; there are different components of it that can be used in different ways. It’s an interesting thing to watch unfold. Turnbull: The other extension we’re working on with that is really looking at mobile technologies, particularly remote monitoring using smart phones and all the apps that are starting to explode on that front. We’re just trying to wrap our heads around how do we manage that and how do we deliver it as a service in terms of supporting the docs here. It’s another program that’s very new and very much in its infancy and we’re just trying to figure out how do you do that the best way, particularly as we try to keep patients in their homes post-discharge. Although in this state, for some reason or other, our return rate within 30 days is very low. There’s only one hospital in the whole state that has actually had any deductions under that program where they get penalized for being above the average. It’s just a small hospital and their volume is so low that it would only take a couple of patients to be penalized.